If there is a shortage in workers in the agricultural sector, wages will increase to attract and keep staff. 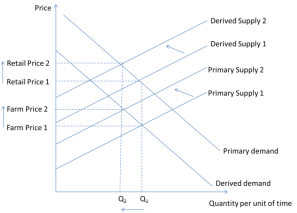 This causes a shift in both the derived and primary supply curves occurs upward and to the left thereby decreasing quantity and increasing price. The change in prices on farm is reflected in both derived supply and primary supply curves are shown below in Figure 1. The margin is not significantly altered between the retailer and the farmer as it is shared between them (University of New England, 2014, pp. 10 – Annotated Notes). The primary demand and derived demand curves are not affected by the change in labour (input) price. Retail margins should be considered to have a greater margin for a number of reasons. Firstly, retailers may have anticipated price changes and have already elevated their price so a small increase can be absorbed readily and menu costs would be low. Secondly, cost increases may immediately be passed on to consumers whilst cost decreases are not passed on for a period of time. Lastly, the buying power of the retailer is much stronger than an individual farmer (or possibly even an industry agent) this may force the farmer to accept a lower price increasing the retailers margin. The AECL is a voluntary organisation for egg producers in Australia (Australian Egg Corporation Limited). The AECL is attempting to utilise its membership in a cartel arrangement by “encouraging” their members to decrease the supply of eggs to market. The Australian Consumer and Competition Commission frown on cartel type arrangements as they are anti-competitive and are attempting, illegally, to control supply. Non-members can still produce as many eggs as they wish without this restriction. This in turns encourages members of the cartel to produce more or break the rules to remain competitive in the market. The article outlines a number of key issues in respect to future productivity of the Australian agricultural sector. It has been noted that the level of publicly funded research and development into agricultural commodities has decreased over the past few decades. Research and development is paramount to the ever increasing demand for agricultural commodities to fuel an ever increasing population in the long run. Methods to improve technology to decrease production costs, increase yields, and possibly more importantly to improve the effect on the environment and manage the risk of climate change. This improvement may entail improving the efficiency of the farm: i.e. using the less inputs to obtain an equivalent volume of output or altering the size of the farm so that scale efficiecieces can be utilised. With scarcity of resources such as land, water and also crop choice, the choice of commodity being produced with limited resources needs to be researched and evaluated: drought resistant crops, irrigation or other methods that will produce high yields, do not provide excessive externalities to the environment but also cam stand up to the changing climate of Australia need to be considered. Research and development comes at a significant cost, but the returns on the investment can be up to 40%. This research comes also at a significant time cost: the time spent on finding new production methods can be very extensive, take a long time to implement (depending on the production life cycle) and even longer time to have the outcome truly realised. As with all resources, there is a finite amount of resources for production: whether it be available land, labour or capital, there will always e competition to achieve the highest amount of utility from a resource. If an employee can receive better wages working in the mines, then agricultural labour will shift as more employees leave for other industries. The wages of the existing (and new) agricultural workers will increase and the number demanded will decrease. From the farmers point of view, if a particular commodity is receiving a higher net price, the decision will be made to produce the commodity that will provide the greater profit, whether it be wheat, beef or mining or a combination of all three to maximise the profit to the farmer. The higher prices received by mining is a significant factor in farmers choosing mining over agriculture. The mining resource boom has also led to the Australian dollar being valued more highly in foreign exchange markets. Other sectors have not faired so well with this boom: they may receive a decrease prices for domestic commodities in the international markets. Climate change, and the environment in general, is a very complex, misunderstood, controversial and political issue that will plague the agricultural industry for many years to come. Its true effects cannot be measured readly – for example, has the effect on agriculturall output been due to climate change, poor management or a cyclical or unexpected series of events naturally occurring in natire? As mentioned previously, research and developmemt can assist farmers to improve the technical efficiency of farms but is often not included in productivity calculations. The risk from the environment can be mitigated (i.e. floods, drought, pests etc.) but these risks need to be established before production begins. Is it noted that figures within the article were devoid of climate change effects: externalities both positive and negative were also excluded. It appears that even though the environment is pivotal to agricultural production the long term effects are not taken into consideration. Therefore standard productivity calculations appear to be biased towards production inputs and only partially represent the actual productivity of the farm in question. The TFP figure can be misleading if all factors of production are not considered as a whole. An individual farm may produce multiple commodities (i.e. wheat and cattle) to doversify their risk and maximise profit. The TFP measure does not segregate the factors of wheat production and the factors of cattle productin: the technology such as irrigation systems, skilled (or unskilled) labour, farm equipment (tractors), grain / feed storage may habe dual purposes. By isolating specific on-farm functions only a partial analysis can be formed: there may be significant interdependencies between the commodities (i.e. the land may be left fallow for 1 season to allow the cows to fertilise therefore the land is regenerated and fertilised and less chemicals are required once planting resumes on this land). The standard TFP equation does not indicate from where the productivity gains (losses) originate from: it is only a measure of how much is changed. There are a number of aspects to consider, as mentioned previously, including scale and technical inefficiencies. The farmer can review the output to establish whether with the same inputs, that outputs could increase. Secondly, the farmer could also research, ecoomtrically, that the same output could be achieved by having a smaller land size. Maximum output is not always best when the quality is not at an acceptable standard. As farmers are profit maximisers they need to look deeper into their production methods to improve their profits and efficiency. Productivity is undoubtedly of the most significant issues in internatopnal competitiveness. Resource usage both on the domestic and internatoomal stages, is to use inputs efficiently within the agricultural sector so as to maximise revenue, but also keep the resources in the hands of farmers not other industries. In comparison to other sectors in the economy, from 198-2011 agriculture has been the highest growth rate by far. It is interesting to note that the growth rate for all sectors has been steadily decreasing since 1986 with a few minor exceptions. Has the lack of Australian research and development in these sectors contributed to only 0.9% increase over 25 years? It is also clear that the methods of evaluating productivity need to be taken into consideration when reviewing or analysing productivity data. The two institutions mentioned, ABS and ABARES are using difference performance criteria and sectoral data. When analysing different domestic and international segments, the performance criteria should be the same to avoid potential analysis errors. Commodity prices will always be volatile – it is the nature of agriculture. It is noted that government intervention, that has been prevalent in the past, may not be necessary to maintain adequate food supply. The future of Australian agriculture is healthy, however steps must be take to ensure that appropriate and targeted research and development is increased rather than removed to ensure an adequate food supply but also ensure that the resources required are not depleted through transferrance to another industry or through environmental degradation. "Impact of Commodity Prices on Agriculture Industry." UKEssays.com. 11 2018. All Answers Ltd. 04 2019 <https://www.ukessays.com/essays/economics/impact-commodity-prices-agriculture-6570.php?vref=1>. "Impact of Commodity Prices on Agriculture Industry." All Answers Ltd. ukessays.com, November 2018. Web. 20 April 2019. <https://www.ukessays.com/essays/economics/impact-commodity-prices-agriculture-6570.php?vref=1>. UKEssays. November 2018. Impact of Commodity Prices on Agriculture Industry. [online]. Available from: https://www.ukessays.com/essays/economics/impact-commodity-prices-agriculture-6570.php?vref=1 [Accessed 20 April 2019]. UKEssays. Impact of Commodity Prices on Agriculture Industry [Internet]. November 2018. [Accessed 20 April 2019]; Available from: https://www.ukessays.com/essays/economics/impact-commodity-prices-agriculture-6570.php?vref=1.